Alarm blasting, gahhh! We almost slept nine glorious hours in our fly-less tents. The temps were perfect for camping and star gazing. However, even nine hours of sleep didn’t seem like enough time to fully recover from our exhaustion the day prior. With a whole lot of work to go, we peeled ourselves from our sleeping bags and got breakfast rolling. Within an hour, we were all upright with packs on, ready to take on Cheops Pyramid. Even though it looked sketchier than the plateau, trip reports said it was supposed to be pretty chill Class 3 climbing. We trekked out from camp once again, and we all knew it was going to be one long day, but hopefully a good one! 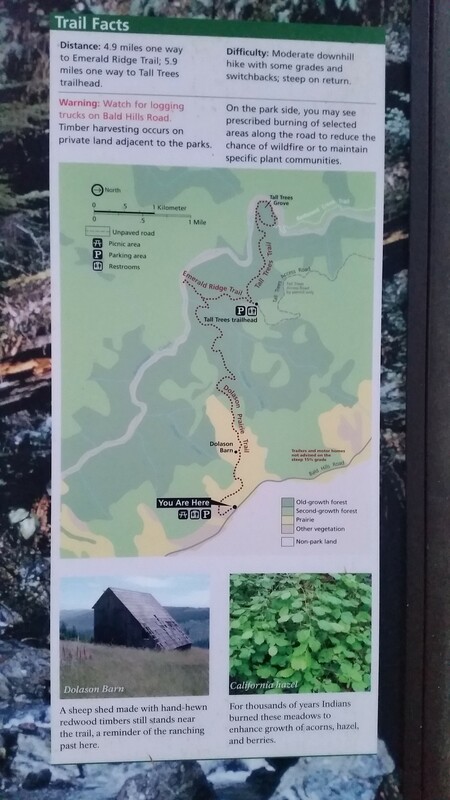 We picked up the Utah Flats use trail and began hiking north once again. However, after a quarter mile or so, we left the trail and made a B line across the open desert towards the eastern wall of the Cheops Plateau. Looking like a battleship in ram mode, we covered the terrain, boulder hopping, kicking up off camber dust, and slowly picking our way towards the huge face in front of us. 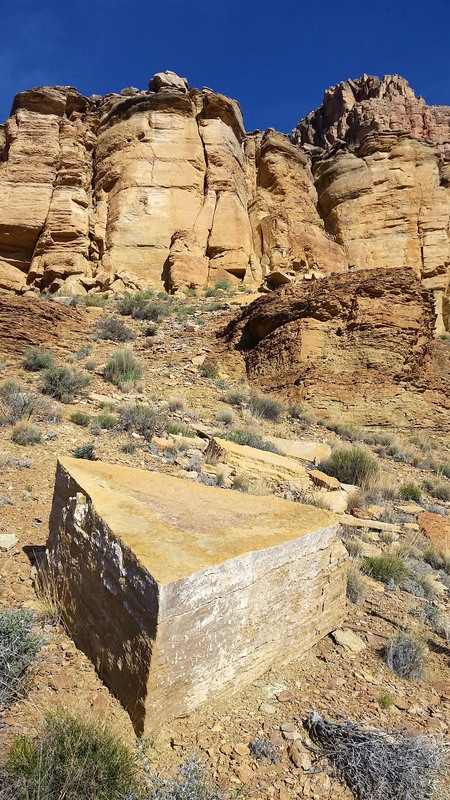 We had to circumvent large sandstone dry waterfalls that would easily spell utter tragedy with one misstep. We hiked on, splitting up and rejoining, all trying to find the best way across the steep slopes on the eastern side of Cheops Plateau. Rene and myself went high while Mark and Kari stayed low. We continued to skirt the slopes and we all met up at the start of the Cheops Pyramid scramble searching for any sign of shade we could find. The sun had already started to go to work on us, warming our hat shaded faces. We sat down at the base of the climb for a quick snack and water break. We chatted about the climb the day before and we were all curious as to what was in store for us. Soon we picked up our packs and set off again, headed up and left to circumvent a small vertical face. We encountered our first climb, which seemed a bit more difficult than described, but it went quickly. Route finding and cairn searching were back in full swing as we pressed up the face attempting to find the best way up. Some of the ledges ahead looked impossible without rope at first glance, but with a closer look we found the line, and a few faint cairns. We ascended the next ledge and headed up and out left towards a small exposed arête. “This thing was supposed to be all chill Class 3, right? !” I thought to myself. I got on another small climb with questionable rock towards the top and just made it happen. The down climb was future Mike’s problem! We all took a quick breather and looked towards the peak, it was only 50 feet away, and once we noticed it there was no more need to break! We moved swiftly up the chossy rock and soon we were all, once again, simultaneously touching the top of Cheops Pyramid! Man what a view! 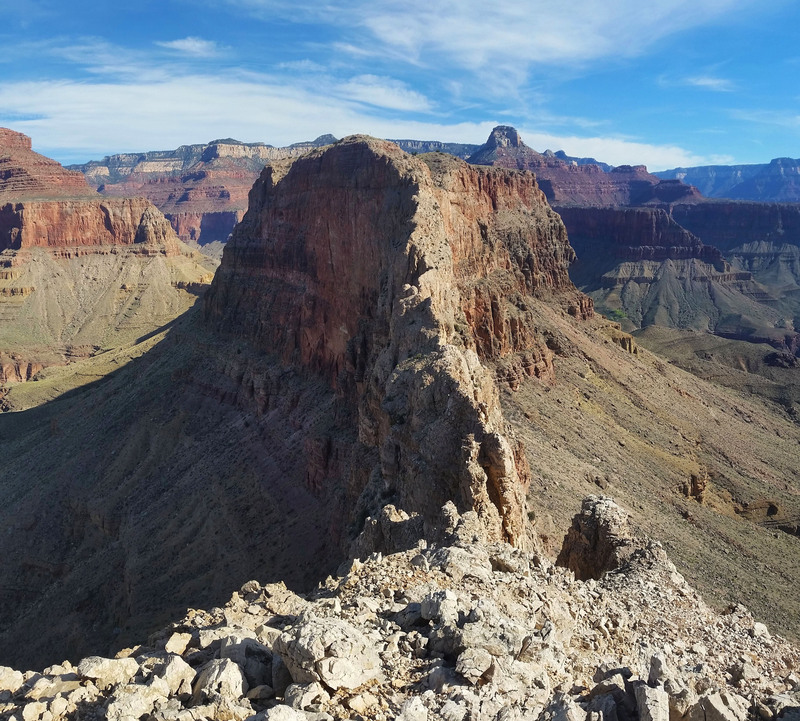 The Grand Canyon is such a beautiful place, the 360 degree view that we had the privilege of enjoying was nothing less than spectacular! I once again walked towards the bridge that connects Cheops Pyramid to Cheops Plateau to have a look, and once again it seemed like such a tough undertaking. All of the rock on the bridge looked chossy and the route looked hard to protect with gear; not undoable, but it would require a full level of commitment to a climb of questionable quality. After signing the registry, we regrouped and picked our way back to camp. It always seems to be easier on the down climb, you see a line you didn’t before, or an easier way to take on the obstacles. This climb was no different, the seemingly tough Class 3 climbs lost their bite (except for the rocks, they were sharp as hell!) as we descended. The slog back to camp was a good long one. 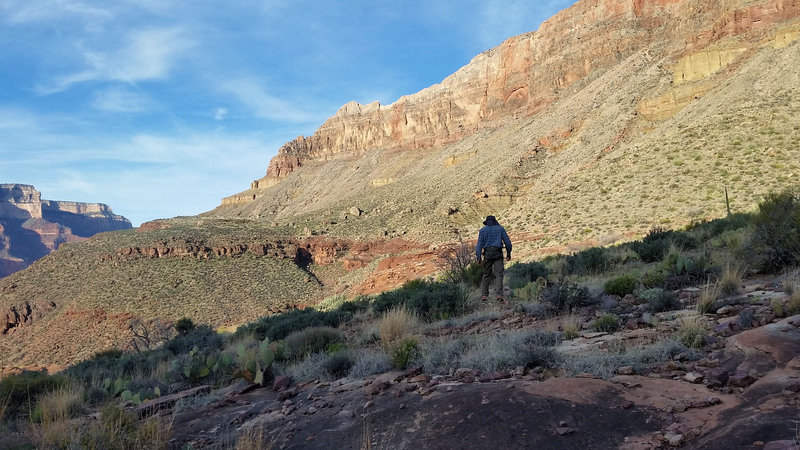 We finally got back to Utah Flats, packed things up, and divvied up our remaining water to get ready for the steep and loose descent back to Phantom Ranch. 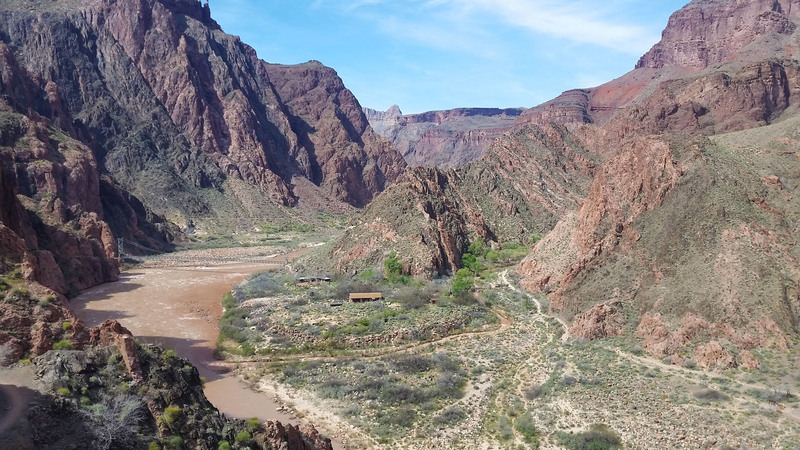 After descending the sun baked steep and loose Utah Flats trail, we were soon sitting at the Phantom Ranch cantina with a cool Arnold Palmer in hand. We were all trying not to think about the nine miles and 4600 feet of elevation gain that stood between us and Bright Angel Lodge. Old school bottle we found on the traverse back from Cheops, we aren't the first explorers here that's for sure! Time to get some gain! Found a Tick on me!!! 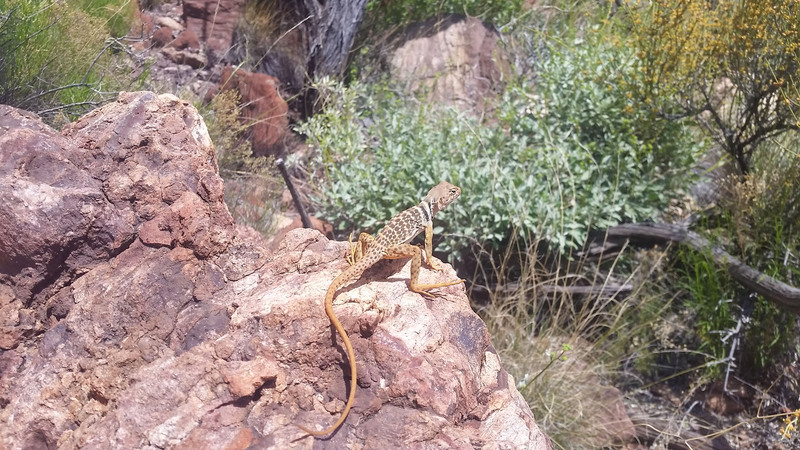 Holy wow, first time ive seen one in the desert, weird lookin guy! 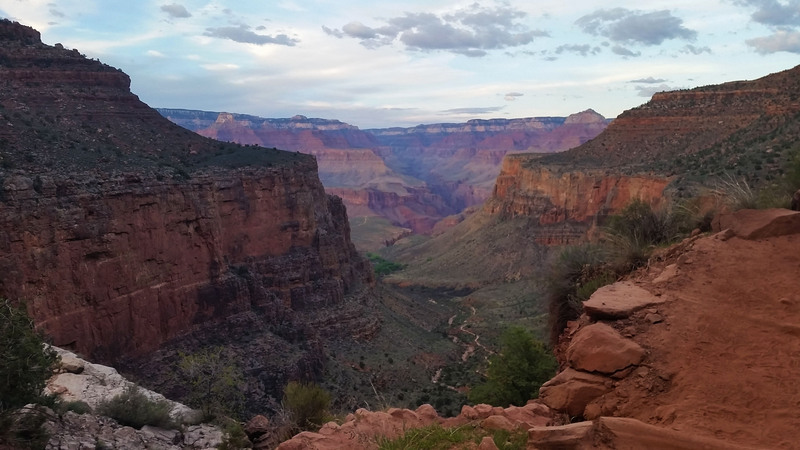 Half way out the Bright Angel trail as the sun set, how beautiful it is here! 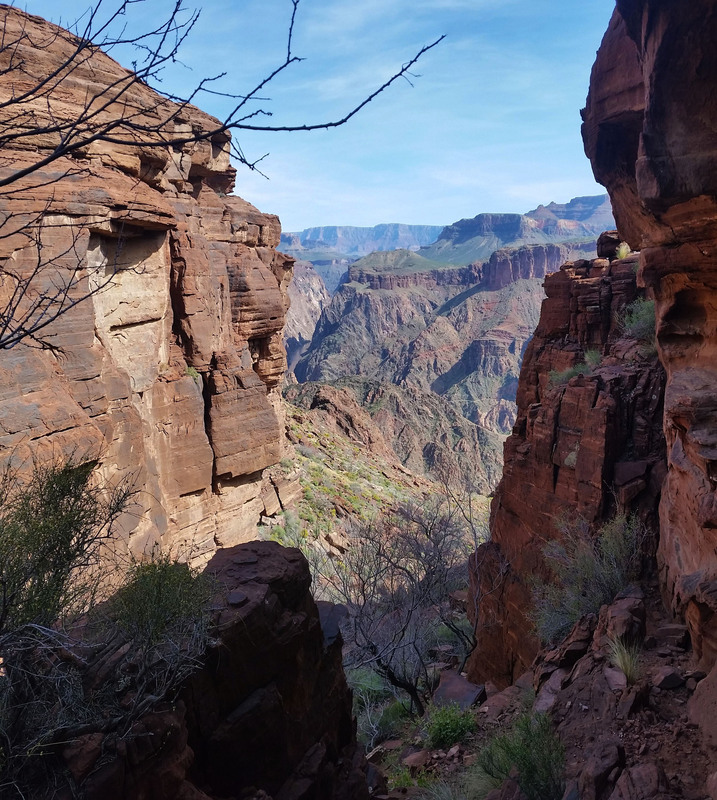 Finally, around 2:30pm, we geared up, threw our packs on, and started our walk out on Bright Angel Trail. 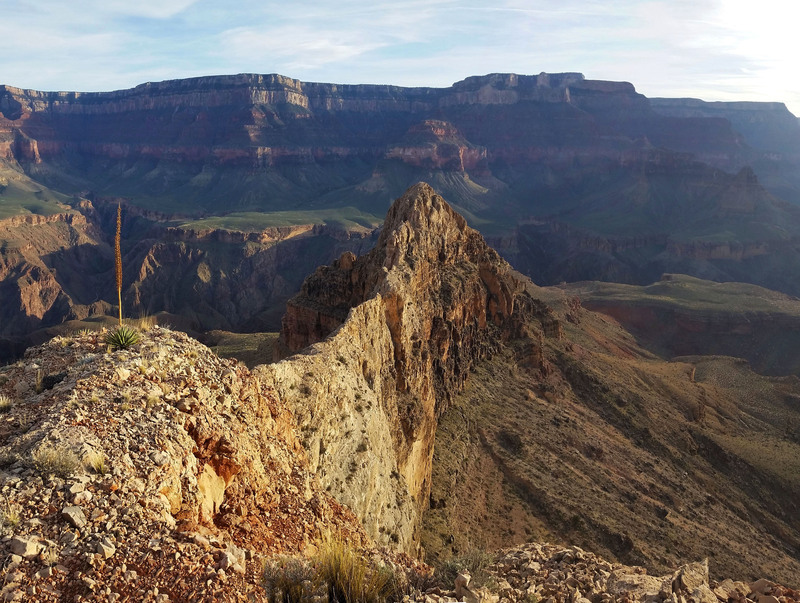 On every switchback that turned our gaze back to the North Rim I took a moment to look at all of the buttes, temples, and massive formations sticking above the canyon floor. It’s like inception; you may never have noticed them before, but once you know them by name, and attempt to climb them, you can never forget their existence. 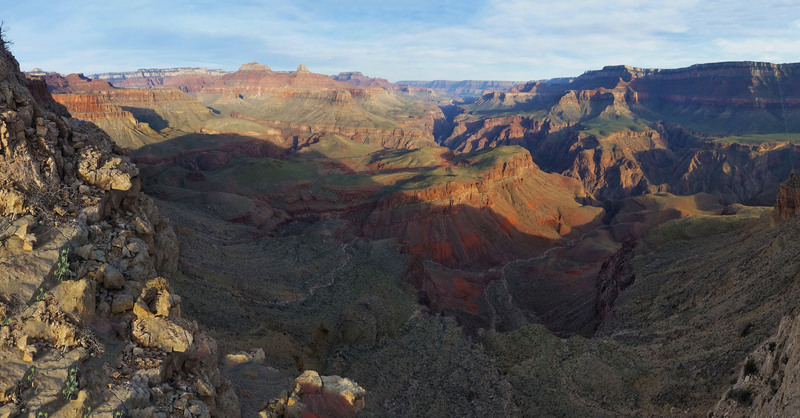 The Grand Canyon is an incredible place. I love it here. Found a the only watering hole in the area! Up and out! The lighting was killin it! Man look at that view! Food: 1/2 avocado, 1 Power Bar, 1 Kroger Protien bars, 1 Cliff Protien Bars, 1 granola bar, 1/2 bag of gummyworms, Orange, 1 Mountain House: biscuites and Gravy, 1/2 bag of Salt and Veinagr Chips, 1/2 bag of Pizza Pringles, 1/2 bag of trailmix. 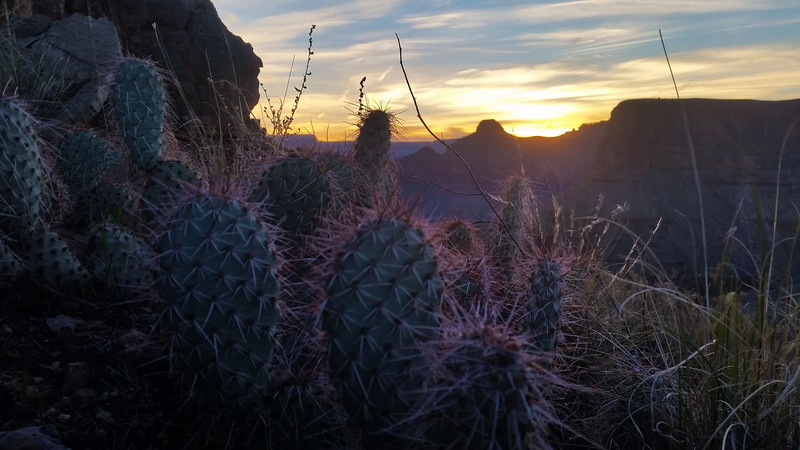 We woke to 30°F temps on the South Rim. Mark, Kari and I were stuffed into Mark’s tent and Rene was cozy in the bed of his truck. 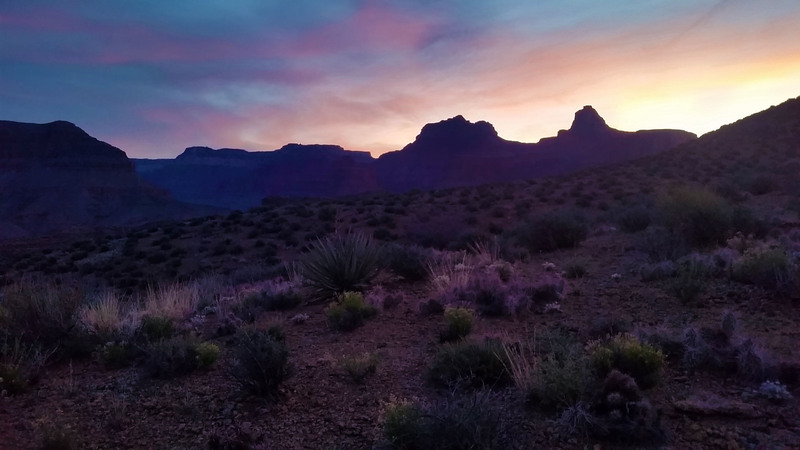 We had another “bum rush” weekend on our hands; we drove up the night before the trek, camped for the night, and would catch the 8 a.m. bus from the Bright Angel lodge to the South Kaibab Trailhead where we would dump into the Grand Canyon to start our weekend adventure. The target was Cheops Pyramid and Cheops Plateau, both standing over 5000 feet in elevation and located in the heart of the Grand Canyon. We would trek in, camp at the base of Cheops Plateau, summit the Plateau on the first day and summit the pyramid on the second day. 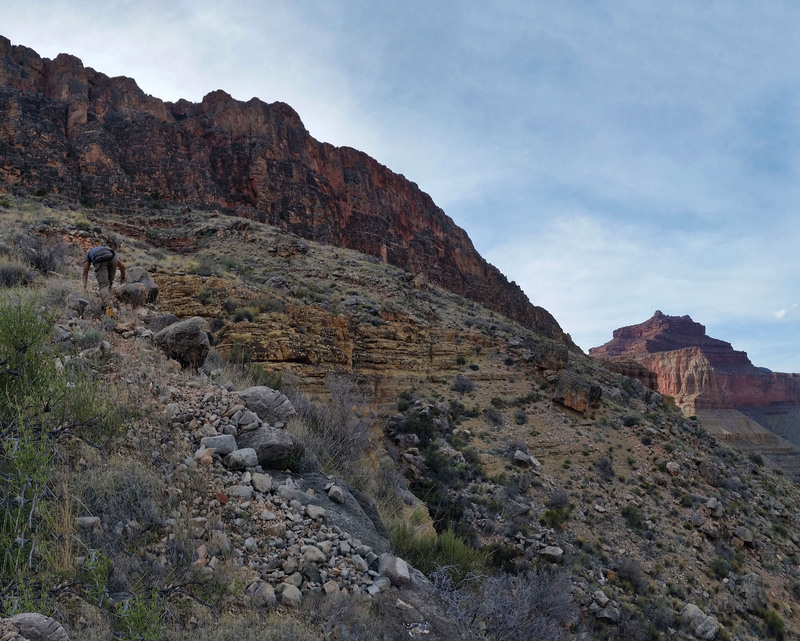 After summiting Cheops Pyramid, we would then hike out of the Grand Canyon for the long car ride home on Sunday night. Needless to say we had our work cut out for us! After getting our gear together, we parked the truck and caught the Hiker Express shuttle bus to the South Kaibab Trailhead. Next thing you know it, we were standing on the edge of the south rim looking at the daunting task we signed ourselves up for. 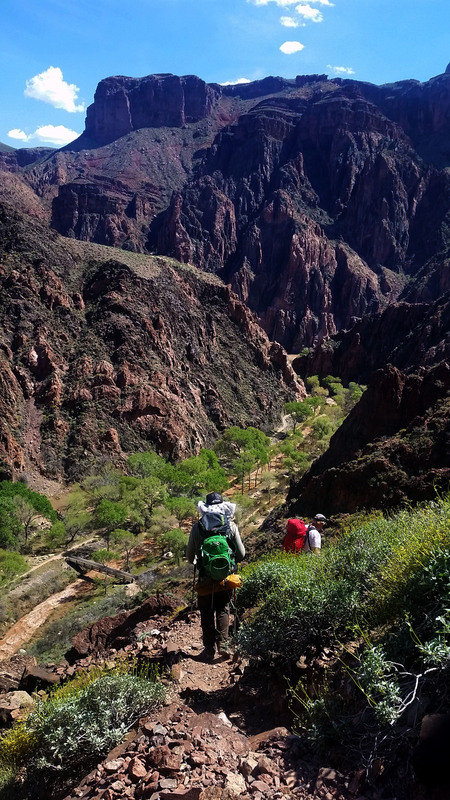 Everyone was excited and in high spirits and we took off down the South Kaibab trail. There were quite a few people already trekking down the trail. We pressed on, pausing briefly for pictures and to peel off jackets as the sun hit us and temperatures began to rise. By the time we got down to Phantom Ranch, it was nice and toasty outside. We hit the water supply there and gained a good 16 pounds from loading up on 6-8 liters a piece. 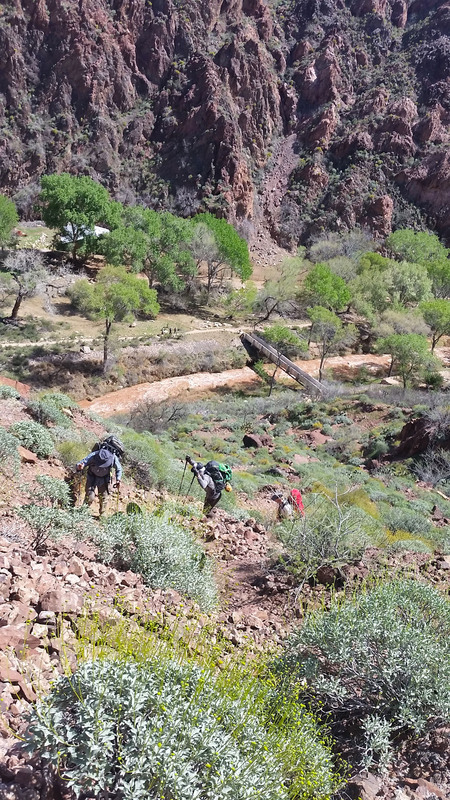 Weighted down and ready for the grind out of Phantom Ranch we headed back towards the small aluminum footbridge that brought us to the start of the Utah Flats Route. The route was rarely traveled and started out with some wicked elevation gain. Full 40 pound packs pulled us down and wrenched on our backs as we gained elevation in the hottest part of the day. Pushing on and up the loose trail we were all breathing hard, dripping sweat, redlining our pumping hearts, and just trying to hold on under the blazing suns heat. We found a nice shaded boulder on the way up and decided to pull off for a quick rest. Mark piped up “Man, I’m getting hammered dude!”. We were all pretty fried from the quick ascent, but after some much needed shade and rest, we regained our spirits and pushed on. Soon we were out on the Utah Flats plateau above looking at the east side cliff faces of our targets; Cheops Pyramid and Cheops Plateau. Both magnificent Cheops landmarks looked beastly and dicey. The notch to the mesa above awaits! 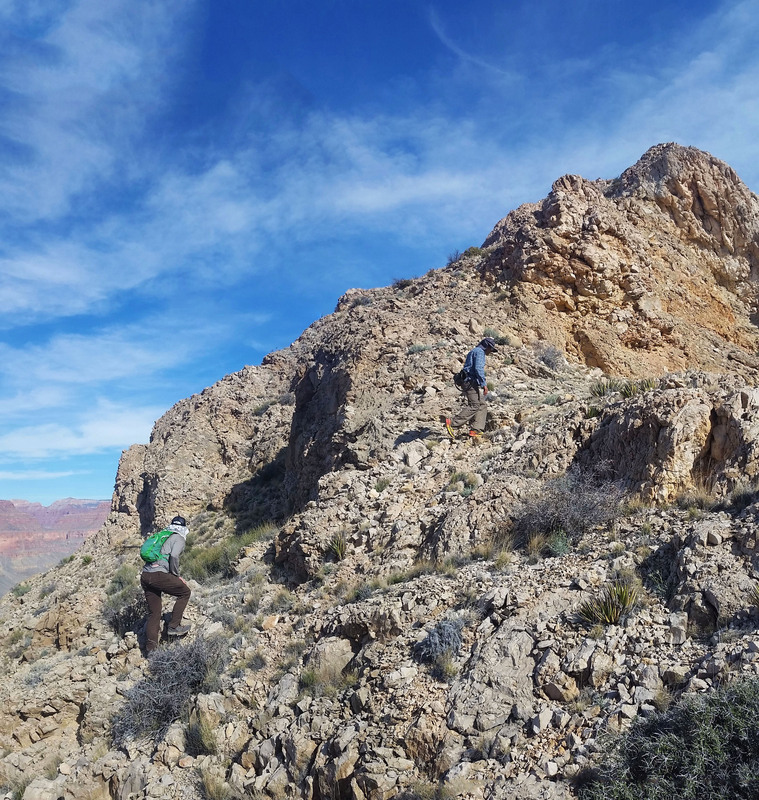 After searching around for quite a while, we found one of the few flat spots that wasn’t infested with cacti and threw our gear down. After setting up the tents and whittling down our packs to just day hike mode, we took off towards the North Ridge of the Cheops Plateau. 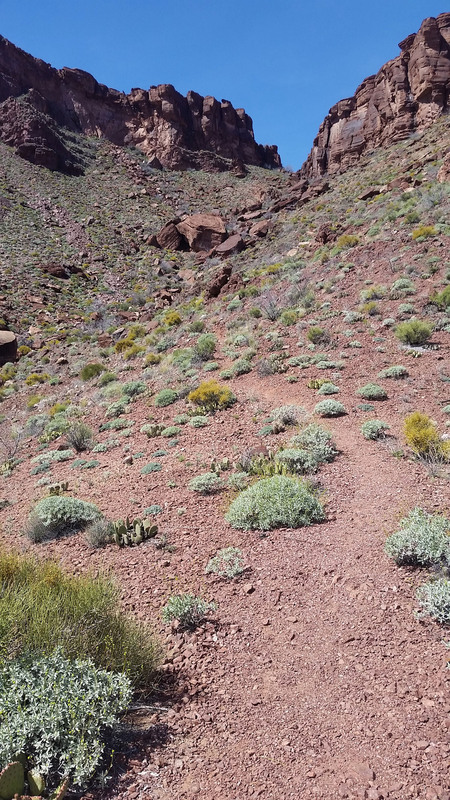 We picked up a small use trail that skirted the north side of the huge plateau. We could see bright green trees drinking from the cool waters of Phantom Creek which we heard flowing in the distance. The wind finally picked up and we got our first taste of cool air for the day. What a relief! We kept trekking on the Utah Flats Route until the North Ridge of Cheops came into view. It looked pretty intimidating from below, but like many daunting obstacles, things seem to become more doable the closer you get. We pressed up the steep loose slopes on the northeast side of Cheops until finally reaching the vertical cliff face of the plateau. Paralleling the cliff wall, we headed North along a faint use trail at a much faster pace than we had on the unforgiving slopes below. Finally, we reached the toe in point on the North Ridge of Cheops. I was excited to start climbing straight up! From our research, it seemed as though it was pretty chill except for one exposed Class 4 move just below the top of the plateau. Looking up at the rock face in front of us, the terrain looked anything but trivial. In usual fashion we slowly began picking away at it. Mark, Kari, Rene Scramble on! I headed up and soon Kari, Mark, and Rene followed. It was time to turn the lizard brain on. Our focus shifted solely to the hands, feet, and the best holds we could find. We cruised up the first few ledges. I poked my head around the face on both sides of the ridge to find the best line and took the path of least resistance. There was a small climb over black rock that I actually had to use a little body manipulation to get up. So much for the route being Class 3! We continued on. Mark, who was following closely behind me nervously awaited the moment when we would come face to face with the crux of the route. Soon I found the spot that most trip logs mention. There was a significant dropoff to the left, but the hand holds were great. The feet placements weren’t as good but they were a heck of a lot better than I thought they would be. Lets go! All four of us cruised through the crux with zero issues! “Hell yes!” I patted Mark on the back who out of the group said he was the most nervous about the route (He cruised it like a champ). We pushed on, carefully up and over a natural arch (which was a bit delicate to say the least) until finally we were standing on the much more tame and stable Cheops Plateau! We all took the opportunity to relax knowing we would have a little time before having to head back down. We all walked to the highest point on the plateau and simultaneously touched the top before signing the summit registry in the ammo box with huge grins on our faces. Man what a day, but it was far from over! 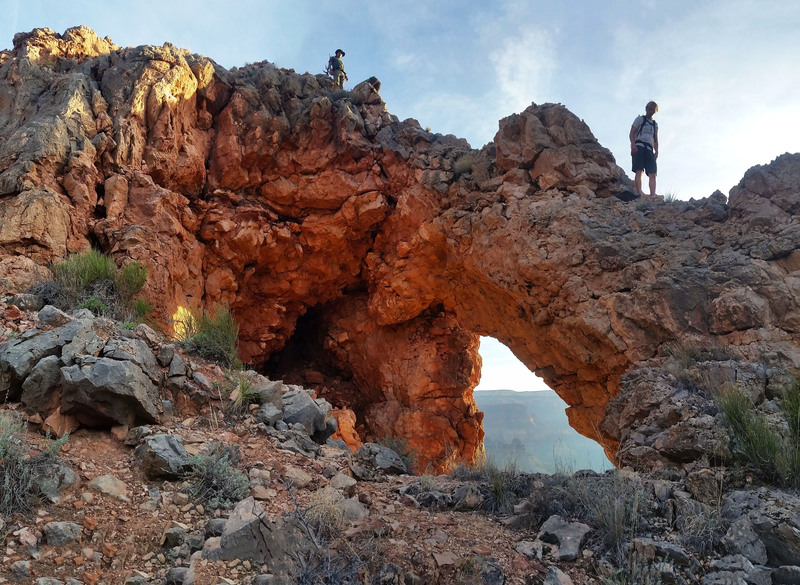 We walked to the southern end of the plateau to check out the crumbling bridge connecting the Cheops Plateau and the Cheops Pyramid that we had plans to summit the next day. I scrambled down to get a closer look at the rotten beast of a bridge. There were two large discontinuities in the knife-edge bridge and the rock quality was absolute crap. It’s not that it couldn’t be done, it would just require adequate gear, willingness to assume a great deal of risk, and nerves of steel to complete the task. After taking it all in we turned back, retraced our steps and soon found ourselves back at camp licking our wounds. We made dinner, and prepared to crash for the night before waking up to have a go at Cheops Pyramid the next day! Looks like we are not alone! Food: 1 Power Bar, 1 Kroger Protien bars, 1 Cliff Protien Bars, 1 granola bar, 1/2 bag of gummyworms, Orange, 1 Mountain House: Chicken and Mashed Potatoes, 1/2 bag of Salt and Veinagr Chips, 1/2 bag of Pizza Pringles, 1/2 bag of trailmix.